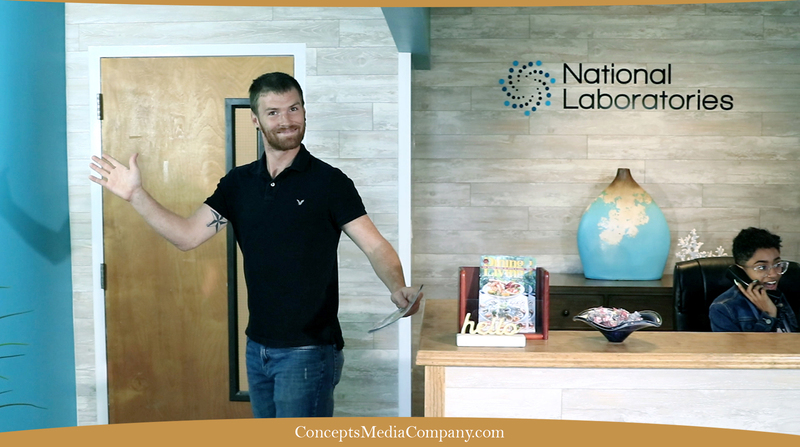 National Labs Commercial by Concepts Media Company in Stuart, Florida. 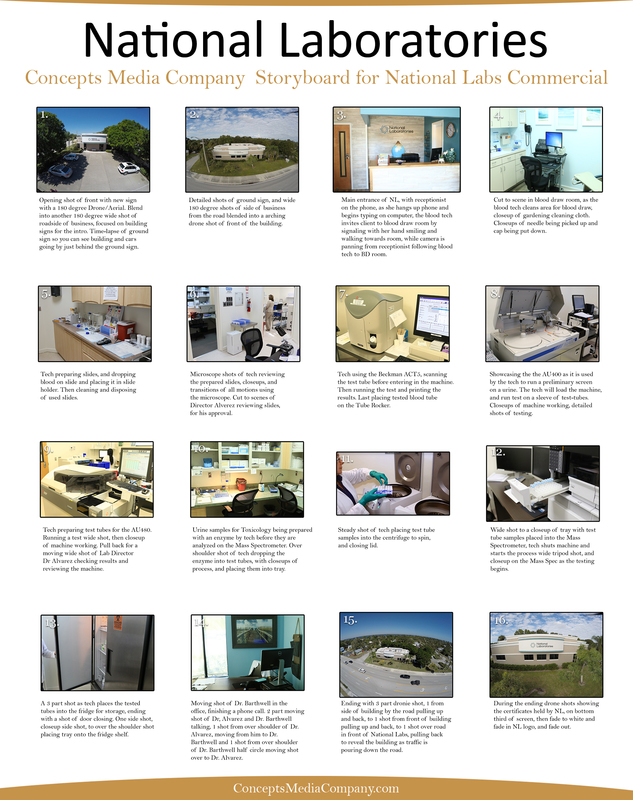 National Laboratories specializes in the detection of substances of abuse for addiction treatment and healthcare providers. In our initial meeting with the staff and walk thru of the facilities. We discussed what they wanted to feature, and learned they were in need of a really specific walk-thru of day to day operations and the technology their qualified technicians operate. We took a walk-thru for ourselves and snapped pictures of the equipment and the concepts of the operations that will be needed shown. Back in our studio we created the storyboard with the pictures we took and scripting the shots needed, with what equipment and staff members that will be used for each shot. Once the storyboard and script were approved and we set a date to film, and scheduled with the staff and technicians we needed for the commercial. On day one when we arrived we did a quick walk-thru to run everything through once more and practice some of the camera movement shots. We started with an opening shot of front with the company’s new building signage in a 180 degree Drone/Aerial shot. Blending into another 180 degree wide shot from the roadside of the business, and a time-lapse of ground sign so you can see the building with cars going by just behind the sign. Once inside, we started filming the main entrance shot with receptionist on the phone, and as she hangs up phone and begins typing on computer, the phlebotomist invites the client/camera to the blood draw room by signaling with her hand to follow and smiling walking towards the room. With the camera panning the front entrance from the receptionist following the phlebotomist to the blood draw room. Next we filmed in blood draw room, as the phlebotomist cleans area for a blood draw, closeups of the needle being picked up and the cap being put back down. Continuing on we set up with a tech preparing slides, and dropping blood on a slide then cleaning and disposing of the used slides. The tech takes the slide to the microscope and we film a few scenes of her reviewing the prepared slides, and cut to scenes of the Lab Director reviewing the same slides before approval. In one of the main testing rooms with some of the very large and impressive testing machines, we filmed the tech using the Beckman ACT 5 scans a test tube before entering it into the machine. After running a test and printing the results, we film her placing the tested blood tube on the Tube Rocker. Then the fun begins as we showcase the AU400 as it is used by the certified tech to run a preliminary screen on a sample of urine. The tech will loads the machine, and as she runs tests on a sleeve of test-tubes we capture it in a series of closeups and moving shots, then really close on the mechanics of the machine as it goes through the process, I couldn’t help thinking of those “How It’s Made” Discovery shows. We also focused on the AU480 running a tests with a wide shot, then more closeups of the machine working. As the Lab Director checks results and reviewing the machine, we filmed him with a couple slow motion half circle shot from behind computer scene around to front of machine as the Lab Director is checking it. In the dropper room as I named it, we filmed some over the shoulder and closeup shots of samples for toxicology being prepared with an enzyme by the tech. Taking the prepared tubes over and placed into the centrifuge to spin, and filming a steady shot of the tech closing the lid and starting the process. The next scenes we filmed with the another huge machine the Mass Spectrometer, with wide angle shots to closeups of a tray with test tube samples being placed into the machine, then as the tech shuts machine and starts the process with a wide angle tripod shot, and into the Mass Spec as the testing begins. Next in the cold storage room, again the name I gave the room. We captured a 3 part shot as the tech places the tested tubes into the fridge for storage. One side shot, to a close up side shot, with an over the shoulder shot as the tray is being placed onto the fridge shelf, and ending with a shot of the tech closing the fridge door. Going into the back offices, we filmed a series of moving shots of the Chief Medical Officer in her office as she is finishing a phone call. Cut to a moving shot of the Lab Director and the Chief Medical Officer talking, with a two part over the shoulder shot moving over from the Lab Director to the Chief Medical Officer and a over shoulder shot from the CMO in a half circle moving shot over to the Lab Director and that ended day one. We started day two with a few re-shoots that after reviewing day one’s footage we knew could be better. We also started shooting the front aerial shots because day one the outside signage in the front of the building wasn’t quite finished. Saving it all for day two with some great slow-motion 3 part dronie shots, the first from side of building by the road pulling up and back, to a shot from front of building and pulling up plus back, and finally a shot over the road in front of National Labs, pulling back to reveal the building as traffic is pouring down the road. During the ending drone shots we edited in with the many certificates held by NL on the bottom third of the screen with a great accompling voice-over, then fade to white and fade in the NL company logo, and fade out to end. 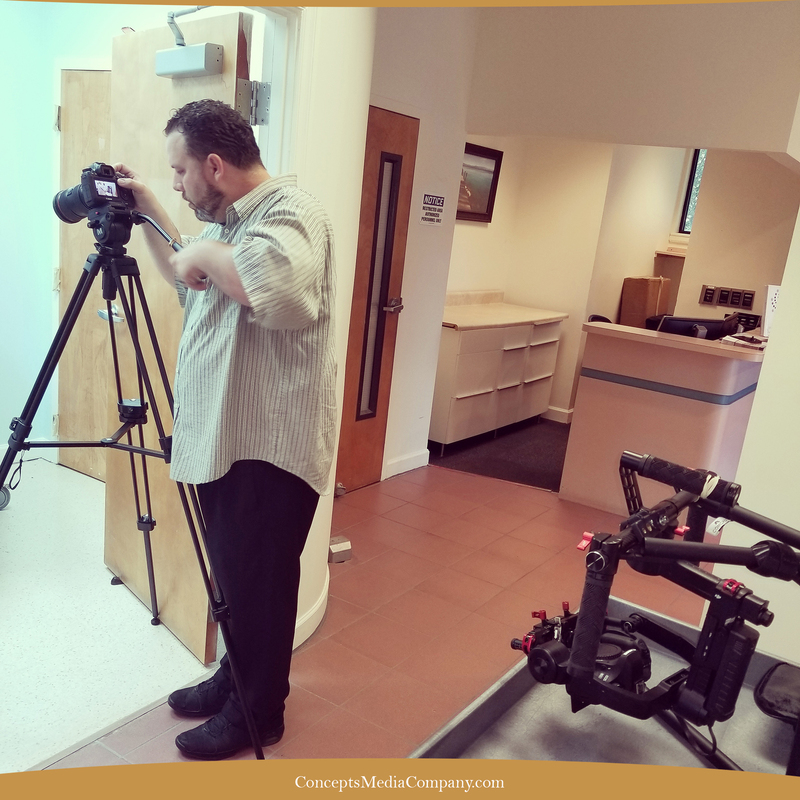 Find out more about how marketing your business with video can help you get seen by millions of social media users, CMC offers great deal on social media marketing and business commercials on the Treasure Coast of Florida. 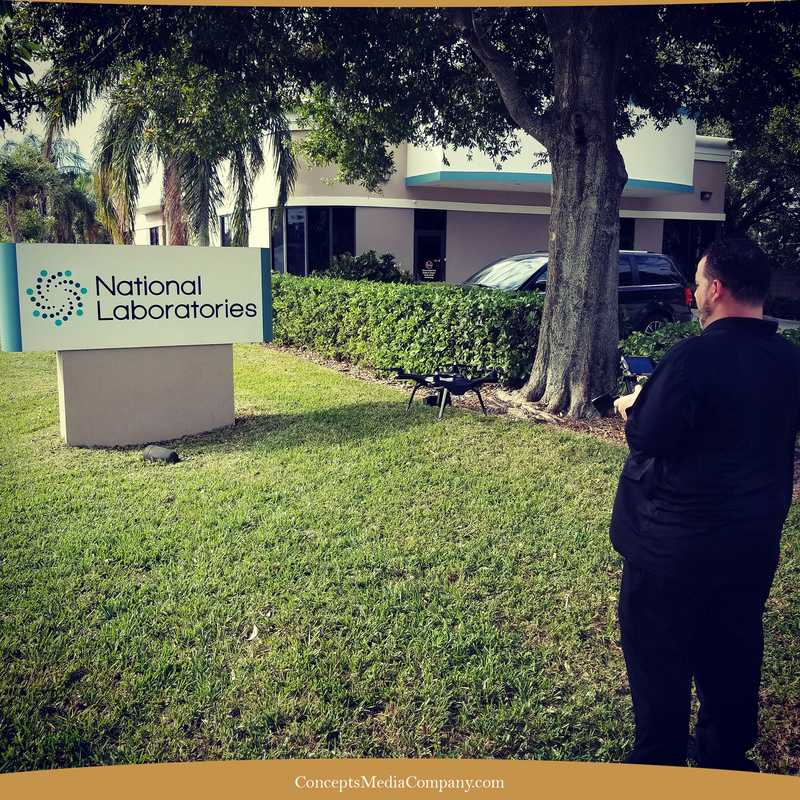 Video production by Concepts Media Company servicing Stuart, Port Saint Lucie, and the Palm Beaches. Contact Concepts Media Company For all strategic social media marketing options and video production located in Port Saint Lucie, Fl.